New Shelving and Racking Website - Shelving & Racking Ltd. This week sees the launch of the new Shelving and Racking website. We are really happy with the new look and we hope it will make it easier for all our customers to find what they are looking for, or to contact us with any questions that they may have. All of the features from the old site are still there, we’ve simply tried to improve the look and ease of use. All of our huge range of products are available to buy, so whether you are looking for column guards for your pallet racking, warehouse steps or lockers you can buy them easily and at low prices from our shop section. 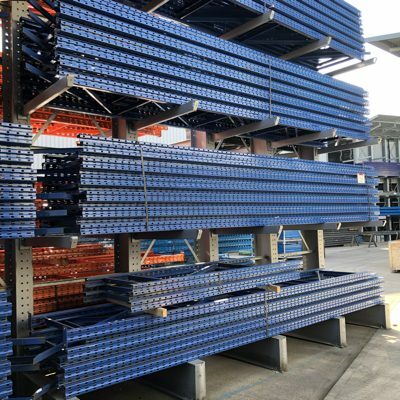 We have huge stocks of used pallet racking from all leading manufacturers (Dexion, Apex, Link 51, Redirack etc), but if you need a specific size it’s always best to get in touch with us to confirm availability. Call us on 0800 612 3210, use the live chat box or send us an enquiry form and we will reply to you quickly. If you aren’t sure what type of warehouse racking you have, go to the identify my racking section for some help, or you can send us a photo of your pallet racking using the enquiry form. The FAQs section of the website answers many common questions about industrial racking and longspan shelving. Please give us a call if there is anything further you need to know. We are always looking for medium to large parcels of quality used pallet racking to buy, the sell your pallet racking section will tell you all the information we ask for if you have racking you no longer need or use. If you have any feedback about the new website, we would love to hear it. Please give us a call or send us a message.